One of the most rewarding things about caring and supporting a young person is watching them change and develop as people, eventually maturing into someone with a place and a stake in our society. So this week we were really thrilled when one of our young people completed their final year at school. For this person this was a great achievement in itself, but they then went on to secure a job for themselves this summer on a building site. 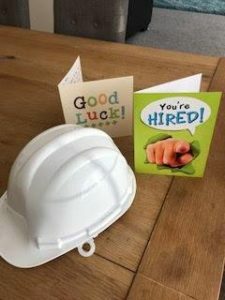 We thought this deserved celebrating with cards and a picture of his new hard hat – a gift from his school for his achievements.